The town of Soissons stands on the left bank of the River Aisne, approximately 100 kilometres north-east of Paris. Exit the R.N.2 dual carriageway at the Reims exit and turn right (coming from Laon) or turn left (coming from Paris/Meaux/Compiegne/Rouen) at the traffic lights and head into the town. After crossing the railway bridge, bear left onto Rue de Villeneuve, keeping the railway marshalling yards to your left to arrive at Soissons Railway Station. At the Railway Station traffic lights turn right onto the Avenue du General de Gaulle in the direction of the Centre Ville to the large roundabout (Place de la Republique). Take the second exit marked Centre Ville and bear right into the main street, Rue St. Martin (one-way). Continue along the Rue St. Martin until you see the Post Office (La Poste) on the right and then take the side road on the right, Rue du Mont Revers (one-way), immediately after the small chapel style building. 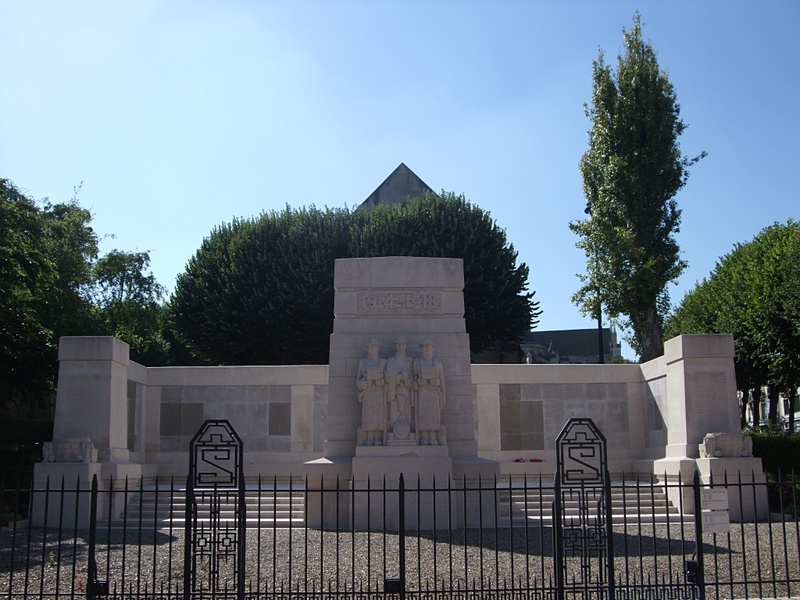 The Soissons Memorial is situated to the rear of this building and is easily identified by its massive white Portland stone construction. There is parking available on the adjacent streets. All visits outside the times stated above and during French national holidays must be made by prior arrangement with the France Area Office. 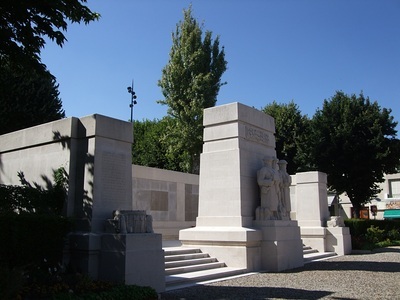 Names are listed on the memorial by Regiments in order of precedence, under the title of each Regiment by rank, and under each rank alphabetically. 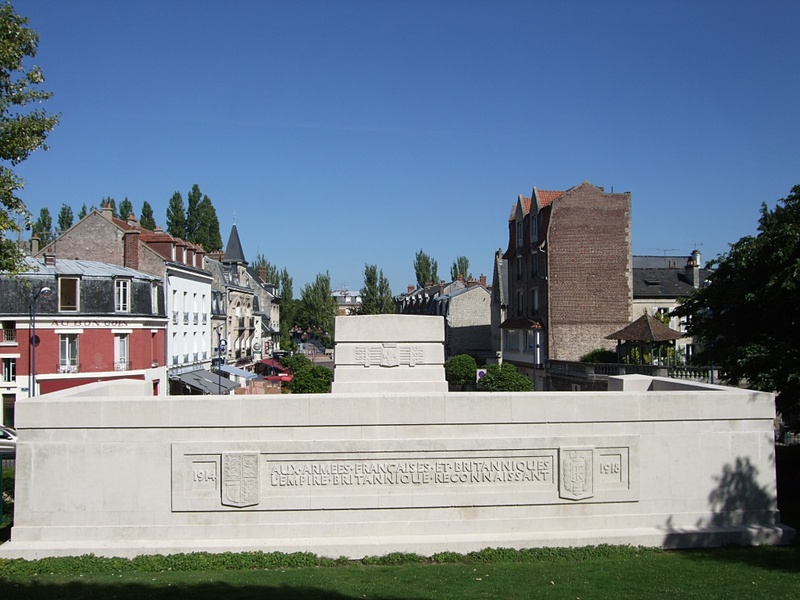 The original British Expeditionary Force crossed the Aisne in August 1914 a few kilometres west of Soissons, and re-crossed it in September a few kilometres east. For the next three and a half years, this part of the front was held by French forces and the city remained within the range of German artillery. At the end of April 1918, five divisions of Commonwealth forces (IX Corps) were posted to the French 6th Army in this sector to rest and refit following the German offensives on the Somme and Lys. Here, at the end of May, they found themselves facing the overwhelming German attack which, despite fierce opposition, pushed the Allies back across the Aisne to the Marne. Having suffered 15,000 fatal casualties, IX Corps was withdrawn from this front in early July, but was replaced by XXII Corps, who took part in the Allied counter attack that had driven back the Germans by early August and recovered the lost ground. Casualty Details: The memorial commemorates 3877 known casualties. 27th May 1918, aged 25. Son of William and Susannah Thompson, of 32, Whalley St., Burnley. 28th July 1918, aged 19. Son of Alfred and Mary Willman, of 67, Glen Eldon Rd., St. Anne's-on-the-Sea, Lancs.